Glove box lock with h700 key. US manufactured exclusively for AJP. These are made by the original manufacture that made them for the government. Glove box lock with h700 key. US manufactured exclusively for AJP. These are made by the original manufacture that made them for the government. Great for M38's and M38A1's which have no secure storage. 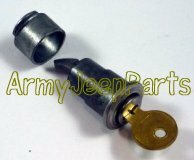 Please Note: Our manufacture can no longer supply the brass round headed key so you will receive a square headed key with this lock.